Performance-car manufacturers faced tough times in the early seventies. Engine compressions had to be reduced to run on unleaded gas, engineers struggled to satisfy emissions and safety regulations, and insurance companies were raising performance-car premiums. While many car makers gave up on performance models, Chevrolet continued to offer the Corvette, which was slowly evolving from muscle car to a sports/luxury car. Consumers responded favorably, with sales steadily increasing throughout the decade. 1973 saw the first major restyle since the 1968 Corvette. With a new federal law requiring all cars to sustain a five-mph front impact without damage, twin chrome bumpers were replaced with an injection-molded urethane cover, painted the same color as the car. Rear bumpers would remain chrome for one more year. A new hood design allowed cowl air induction, and also eliminated the troublesome cowl-panel that raised and lowered for the hide-away windshield wiper operation. The Corvette frame, in use since 1963, received minor modifications. Body mount brackets were lowered slightly to allow use of thicker body bushings. After several years of testing, including racetrack wins, Corvettes were fitted with radial tires. Additional sound insulation was applied throughout the body. This year's model weighed in at 3,725 pounds - just four years earlier, the 1969 Corvette had weighed 3,260 pounds. For car enthusiasts, there wasn't much good news in 1974. The OPEC oil embargo deepened, and in an effort to conserve fuel, President Nixon signed legislation making 55-mph the national top speed limit. The Daytona 500 race was shortened due to the energy crisis. A labor dispute closed the Corvette assembly plant on June 28th until a settlement was reached on September 3rd. To comply with the new rear five-mph impact bumper, Chevrolet engineers came up with a new body-color rear section, replacing the spoiler with a smooth, Kamm-style tail. Because it was unknown whether the new rear section could be made reliably as one piece, it was manufactured in two pieces, resulting in a seam down the middle. Minor suspension changes were made to compensate for the additional 30 pounds of new bumper. Minor improvements for 1974 included a redesigned radiator and shroud for better cooling, and a more efficient air-conditioning system. Base 350ci engine produced 195 horsepower, optional L82 was rated at 250 horsepower. This would be the last year with a true dual-exhaust system, until the 4th-generation Corvette. 1974 was the last year for the big-block engine in Corvettes. At 8.25:1 compression, the 454-cid Turbo-jet motor produced 270 horsepower with 380 lb/ft of torque. The Corvette's rear bumper cover was updated and was now one-piece, eliminating the seam down the middle as seen on the 1974 models. Hydraulic rear shocks became part of the rear bumper assembly. All Corvettes now ran on unleaded gasoline, and HEI (high energy ignition) ignition became standard. Left and right exhaust pipes ran into a single catalytic converter, then split into "fake" dual tail pipes. 1975 was the lowest performance Corvette since the 1953-1954 models, but emissions were just one of the reasons for that. Keep in mind that car manufacturers were just starting to learn how to get power out of engines with reduced compression and running on unleaded gas. Horsepower ratings bottomed out at 165 horsepower, but the 1975 Corvette was still one of the fastest cars available at the time. Although government rollover standards banning convertibles is often cited, it was declining sales that prompted Chevrolet to drop the Corvette ragtop at the end of 1975. 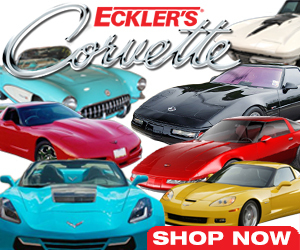 Of the 38,465 Corvettes built this year, 4,629 were convertibles. To reduce interior temperature caused by the catalytic converter, fiberglass front floor sections were replaced by a more rigid steel sub-section. A new sport steering wheel, smaller than previous ones, was offered as an option. Because it was the same wheel used on Chevy's Vega, owners voiced complaints and was dropped from the option list after year's end. Styled aluminum wheels were finally available, and installed on 6,253 Corvettes. At 8.5:1 compression ratio, the base 350ci engine produced 180 horsepower. The optional L82 motor had 9.0:1 CR and put out 210 horsepower. Production rose to 46,558 units, due in part to a recovering market, but also shrinking competition in the Corvette's price and performance class. There were far fewer performance cars of any kind by 1976, which certainly helped renew Corvette sales. The Corvette was evolving into a refined cruiser. Leather seat trim, previously available at additional cost, was now standard, with cloth trim optional. Power steering and power brakes became standard, and Cruise Control was offered for the first time. Padded sun-visors now swiveled to cover the side windows. Base and optional engines remained the same as last years. Engine paint color was changed from orange to blue, although some early production 1977 Corvettes were built with the orange-painted engines. In March of 1977, the 500,000th Corvette rolled off the assembly line. Production rose again to 49,213. Although the tire-shredding power from a decade ago was gone, mid-seventies Corvettes still had a lot to offer. It was more efficient and better-handling than ever, with four-wheel independent suspension and four-wheel disc brakes on every model. And they still turned heads.